For the first time, U.S. officials have sent firefighters to help battle a giant blaze in Canada that has destroyed parts of Fort McMurray in Alberta. 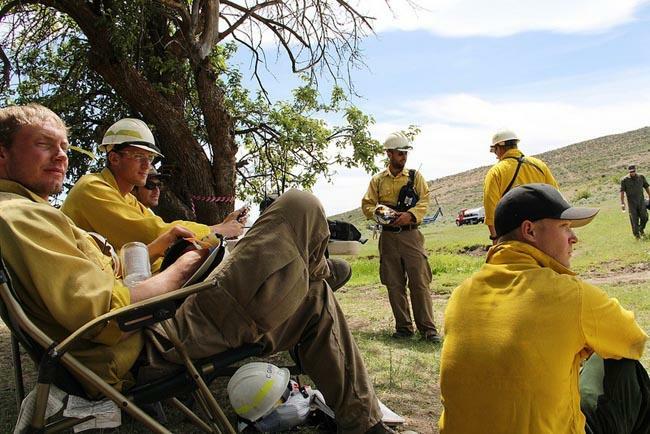 The National Interagency Fire Center says 100 firefighters flew out of in Boise, Idaho, on Wednesday morning and another 100 left from Missoula, Montana. Officials say the firefighters are from the U.S. Bureau of Land Management, Forest Service and Fish and Wildlife Service. During her visit to the National Interagency Fire Center in Boise Tuesday, Interior Secretary Sally Jewell spoke highly of the cross-border collaboration. "We work together across international boundaries, we work together across jurisdictional boundaries, we work with local fire associations like the rural fire protection associations here in Idaho and Oregon to address those initial attacks," Jewell said. "But wildfires know no boundaries." The blaze has forced tens of thousands of people to evacuate, burned nearly 2,000 structures and hurt the region's oil sands industry because of production shutdowns. Earlier this month, the U.S. sent two air tankers from Minnesota to a different wildfire in the province of Ontario. Canada has sent firefighters to the U.S. each of the last five years.